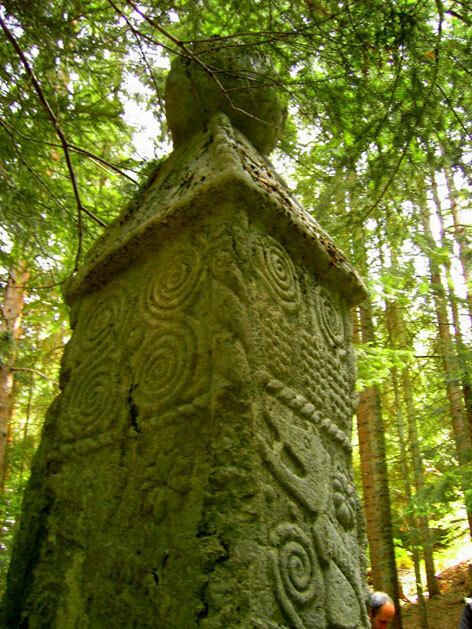 Stone spheres have been found all over the world. The most famous ones are those from Costa Rica (1), where some hundreds of so-called bolas were found, mostly in the Diquis Delta. But spheres have also been found in Mexico (2), (3), Australia, Italy (4), Russia (5) and Egypt. Even on Easter Island in the Pacific Ocean, which is thousands of kilometers away from the nearest civilization, lies a perfectly round stone sphere that is called "The Navel of the World". And recently more and more of them are being discovered in Bosnia as well, simultaneously with the uncovering of the pyramids there (6). The spheres vary in size from roughly a tennis ball to whoppers with a diameter of eight feet (Costa Rica) or even ten feet (Mexico). The weight of these giant spheres is approximately 15 tons. The spheres have a fairly smooth finish and are nearly perfectly round. They have usually been made of a volcanic rock named gabbro. However, in Costa Rica this igneous rock does not exist in the Diquis Delta. The nearest site for this is the Cordillera de Talamanca mountain range, approximately 38 miles away. But no quarries have ever been found here. Because the first discoverers thought there might be something valuable in them, several spheres were blown up with dynamite. However, the stones turned out to be solid. Many spheres have been found in groups and appear to portray an astronomic position, in rows, waves and triangular patterns, with an alignment towards the magnetic north. Some spheres are still there, but many of them have been taken over the course of the years and can now be admired all over the world in gardens and parks. Nobody knows the exact age of the stones and this also can't be retrieved in current science, because carbon dating, for example, doesn't work on this kind of rock. 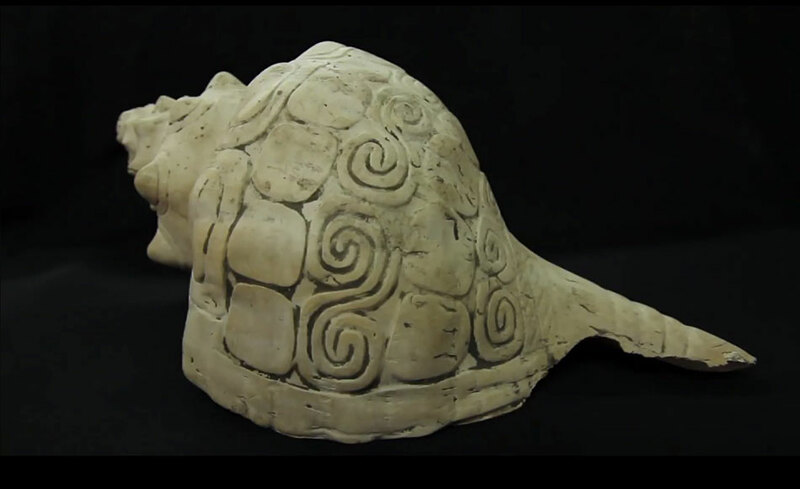 The local Indian tribes say they haven't been made by their ancestors, even though they apparently found these things interesting, because several of them have been found in old graves. Only a few stones have been found with engravings. Those appear to confirm their astronomic function, although not all visible constellations could be identified expertly in the present. Judging from the large interest in the universe which extraterrestrial visitors often incorporated in their art and constructions, our own suspicions are that the spheres were used to portray space; perhaps not on the ground, but in the air. Since anti-gravitiy techniques (7) are child's play for space travellers, we can picture vividly spectacular projections of solar systems that were created by letting the solid spheres circle high above the ground. Once the visitors left, the show was over, and the spheres fell back to the ground with a dull thud. 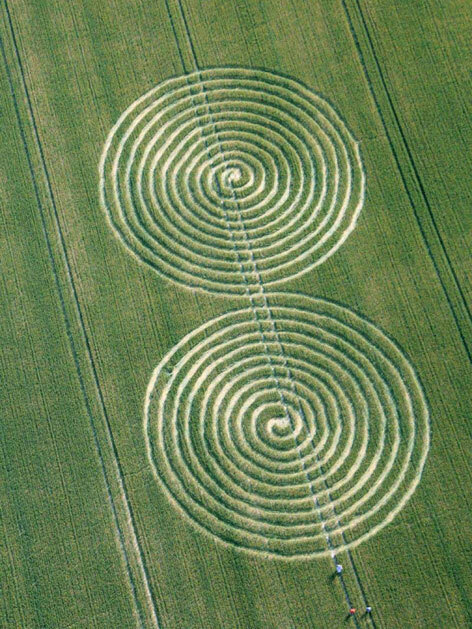 Right: crop circle with a double spiral, found in Chaddenwick Hill in Wiltshire, on 13 July 2011 (Photo: Lucy Pringle).